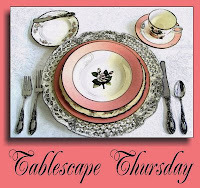 If you haven't heard about Tablescape Thursday, hosted by Susan at Between Naps on the Porch, then I guess you are a new blogger, so let me be one of the first to welcome you to Blogville. If you want to see a lot of wonderful table settings, please click here to go to Between Naps on the Porch and get the links. You will be so glad you did. My napkin rings have been purchased at various junk stores, estate sales, and yard sales, so they obviously don't match. I've had these plates for about 30 years. I think they've been put in the dishwasher so much that I can no longer read the writing on the bottom! My flatware was our wedding selection 39 years ago, and I still love it. It is Old Master by Towle. My bird salt and pepper shakers came from a junk store. I just love their fat little tummies. The bird cage centerpiece includes bird ornaments that I will give to my guests as a favor. Don't forget to go see all of the wonderful tablescape link ups at Between Naps on the Porch. I love your table and I also love birds. I like the fact they do not match. Beautiful!! YOu know birds are a favorite of mine so I was so happy to see you did this!! You have such an eye for putting things together girl!!! Laurie, every time I see one of your new tablescapes, it becomes my new favorite! Honestly, I would be hard-pressed to pick a favorite but this tablescape done in the bird theme is just precious!!! You're so talented, my friend!!! I love this embroidered blue & white tablecloth with matching napkins...it's soooo beautiful! And that beautiful runner that you used under the centerpiece is fabulous too!!! Well, I just love all the mix-matched items...I think they just make your beautiful tablescape...the soft pastel color of the chargers, I adore!!! The little birdie napkin rings...charming...I think I need them, Girlfriend! Hehe! And...I just love your china with the sweet bird pattern...it's all lovely! Then...to use that little bird cage for the centerpiece...awesome!!! Well, I could just go on and on!!! I went through all of the tablescape Thursday posts and seen so many beautiful ones but I believe that yours is my favorite out of them all!!! Does this not match? Looks like it does to me...a bird theme.. blue sky charge plates... I love this table... I hope there is room for one more...ME!! Have a great day! Love the birdies and the plates. Spring has definitely sprung on your table. Pretty perfectly un-matched Laurie, I love the way the different colour pastel chargers look with your bird plates and the centerpiece and all the little birds (rings and fat tummied) are adorable. Happy Thursday, Kathy. What a beautiful table and how full of spring with all those sweet little birds coming around. What a beautiful table for birds to perch on! Great choice to share today! Your birdcage centerpiece is adorable. I love the colors, too! Happy Thursday to you! Laurie, I love the birds! You are so creative. I have to ask ~~ where do you all store these beautiful items ? I would need to build a separate room just to hold them. I have reached the age where my friends and i go out to eat. Nothing real fancy, but it's a treat. I go from breakfast at noon-ish, to diner at 7. Just don't get hungry. I think for me to join this group, you all would have to buy me a husband, and children. Would I want to start again ? Great table! I love your dishes too. My wedding flatware is long gone, as are my dishes. I do like the bird theme....so springy! I think your table looks great. There are few things as boring as when everything is perfectly matched! Love how you put the birds together, it works and is not matchy, matchy. Your guest book TV is cute, I somehow put my photo on twice, tried to make it bigger obviously that did not work, sorry. This is my first Tablescape Thursday and I posted late so guess I am the caboose! 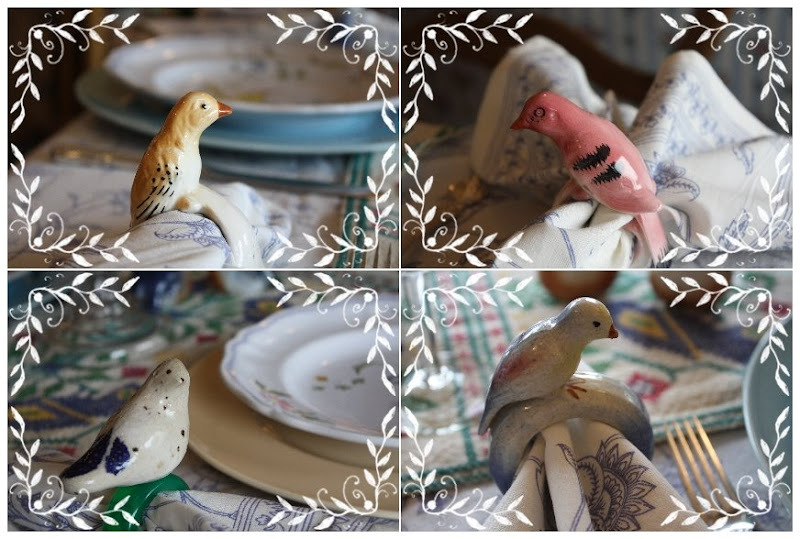 You've made another delightful tablescape...all the bird elements are so sweet. Thanks for your kindness as I am trying to recover from my bout of sickness. The bird theme is great, Laurie. You and I share a love for Old Master. I actually have two sets, the set I got when we married and a set that my aunt gave me that was hers. I still think it's one of the prettiest patterns. That is adorable..love your little birdies! So Springy! Really sweet table this week!! Laurie... your tablescape is just beautiful. I think everybody loves birds... yours is just the perfect mix and match of old and new... and I love it! What time would you like me to drop by for dinner? Love your birdie salt and pepper shakes I collect s&P shakers too. The whole table looks so invitingly lovely...pretty dishes too. Fabulous tablescape, Laurie...you pulled all those "mis-matched" pieces together and created a lovely spring tablescape! I think your title is cute. I am so glad birds are getting so popular. I really like them and everywhere I go I am buying different kinds. I think your table looks great. The napkin rings are soooo cute as well as the salt and pepper shakers. If I saw this display at the store I would definately be looking for a price to buy some...you could have a new career! Those little birds are adorable.Their little tummies are so full because of the beatuiful table you have set. They came to rest on your table after eating all day. Love your little "tweetie birds" scape! I think it's precious! It's all so pretty Laurie. Love the precious napkin rings and plates. I love all your birds! Fabulous. Love how you put together this fantastic fantasy of a spring table ... just gorgeous! What a terrific table -- love the bird napkin rings and the fact that they don't match and were bought over a period of time, the plates are apretty pattern too and how sweet of you to gift your guests with the bird ornaments from the cage! Yes, the silver "egg cups" are really egg cups -- a Victorian way to elegantly serve eggs. A way today to display pretty Easter eggs! Can I just tell you how great this looks! I love that it is a little more casual than we usually see, and those cute little blue birds. I am enjoying all of the 'birdy' decor, our last name is Robbins so I've been going with this for a while. What a tweet little tablescape full of cute birdies! How did you do the scrolly thing on the pics? Looks great. Everything looks just beautiful and I love all the birds. Who needs matching when you have a winning theme? Hello there cutie! I am playing a little catch up today. Your post on having a designated person who could alert blog friends should you be injured/sick and unable to blog was so timely and so important. Pick up sticks reminded me that Spring will eventually come to Central Oregon and your little birds with all the mismatched pieces was adorable. Wow!! Very beautiful and very very creative. Love the bird cage centerpiece. What a pretty tablescape! I love the little bird cage centerpiece and napkin rings! Actually the non matchy matchy really appeals to me. And the little bird napkin rings are the cutest dang things! I love this springy table! That's such a cute table. Your plates remind me of Debbie at Confessions of a Plate Addict b/c they look like those french dishes she taught us about. I couldn't even tell the chargers and napkin rings didn't match. They looked perfect to me. LOL! Oh, and that pitcher was pretty too. SIMPLY ADOOOORE your napkin rings, to the nth degree!!! (I collect them now~ silver, porcelain, you name it!). Am always looking out for NON-matching ones & they're actually pretty difficult to find (the good or nice ones!) & often very $$$, but well worth it just FOR the fact that they DON'T match!!! Tried a garage sale or two for fun & delightful bargains like so many others get to enjoy, but HEAVENS! They're not "fun" OR "good" here in the Tucson area!!! REALLY!!! If I hop a plane to visit you, may I join you on a Saturday for some "FLEA FUN"??? I love the Bird posting the very best! I think your dishes look like mine..Spode Queen's Bird..there is a little difference in the branch, however. Love the napkin rings also..what a treat to get a bird's eye view of Eve's tablescape..and an up close view of the real live nest and dove(I think)..Spring has sprung! Whatdoyamean the chargers don't match? Of course they do! Anything that's half-price automatically matches everything!!! Oh, by the way, look out for bird poop! lol! I love the cage, the birds, the dishes are wonderful! I think when you put things together, it makes a prettier table than, all the china bought together! I trying to collect a few more to be abe to change out. Your table is so Spring! Just love it. Love the napkin rings! Your table designed by Laurie is wonderful! It's so wonderful! I love how you brought together all of your mismatched items. I'd give anything for those birdie napkin rings!!! Thanks for the inspiration.